It is always good to have a meal that can be cooked quickly from store cupboard ingredients. This delicious tuna, caper and lemon sauce uses ingredients from cans and a bottle with just a few fresh herbs, and a lemon, to make the flavours run together smoothly. It is brilliant served with pasta of your choice. In our book Cooking for the Sensitive Gut, published earlier this year by Pavilion we took several favourite recipes including a beautiful, classic Italian sauce and reduced those ingredients that can trigger symptoms in a sensitive gut – making sure the recipe still tasted and looked great. So how do you adapt a tomato sauce to taste great for someone with a sensitive gut? Basically we removed the onions from the recipe (these are a common symptom trigger ) and used garlic oil to flavour the sauce instead. We also and packed the sauce with herbs (bay leaves and dried oregano) and took care to season it well. The sauce was then cooked slowly to allow the flavours to develop. This more than made up for the lack of onions and it tasted terrific. 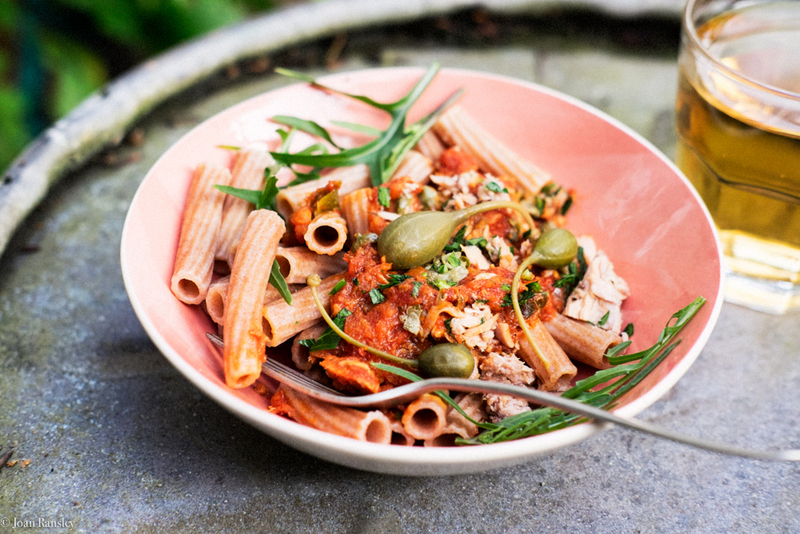 In this recipe I have taken our classic tomato sauce, added lemon zest, chopped capers and flaked tuna to make it a more substantial. It is quick and easy to cook and just the thing for a beautiful summer evening. 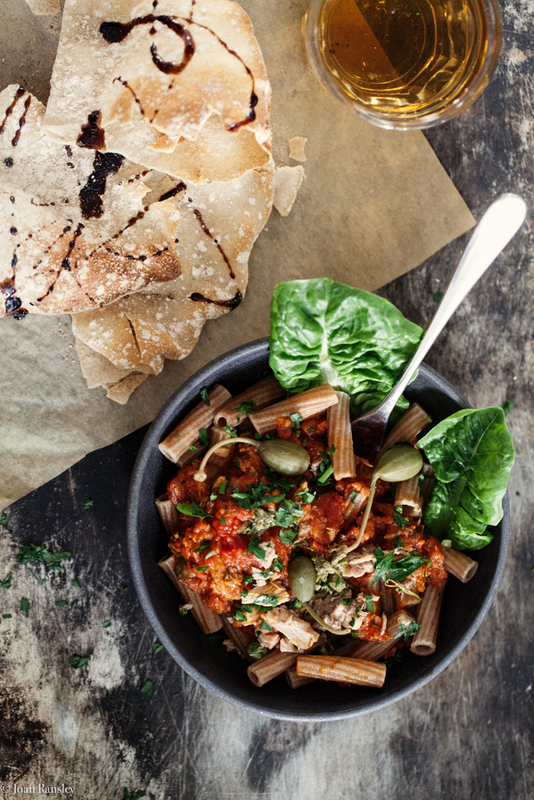 Just a note about pasta… regular pasta made from wheat contains both gluten and fructans – a type of FODMAP. Gluten may not be a problem for you unless you have coeliac disease in which case you should avoid it. You may however be intolerant of fructans which means you will have to assess a portion size of pasta that suits you. Most people with IBS can tolerate 75g of regular cooked pasta (half a usual portion) because this amount it low in fructans. Or you can try gluten free pasta which is also low in fructans because it does not contain wheat. Add the plum tomatoes to the saucepan and break them up with a wooden spoon. Swill the empty tomato can with a little water and add the water to the sauce. Drop the bay leaves and dried oregano into the saucepan and season well. Cook the sauce gently for at least 10 minutes in a covered pan and a further 5 minutes without a lid. This allows the sauce to thicken to the required consistency. Taste the sauce and add a little sugar if required. Season well with pepper and salt and add a little sugar if needed. Flake the tuna into a bowl and add the grated lemon zest and chopped capers. Season well and mix half of the tuna into the tomato sauce reserving half to serve separately. 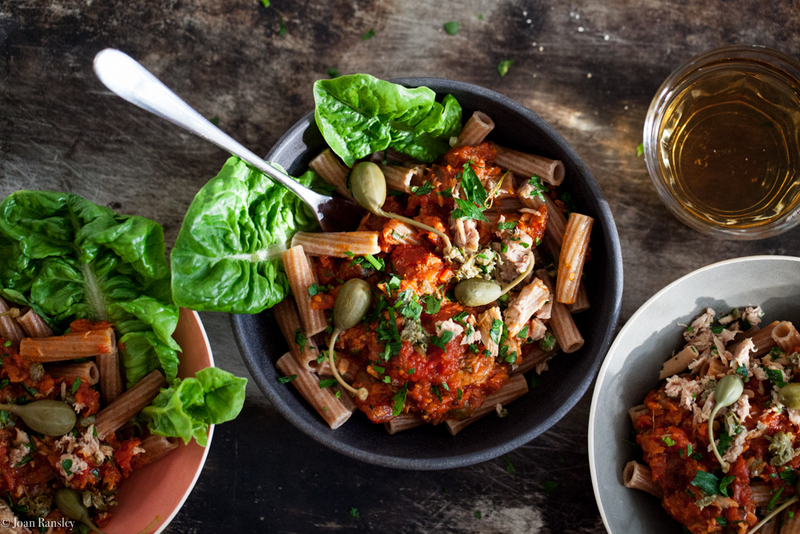 Serve the pasta in bowls with a little sauce. Sprinkle the remaining tuna and caper mix over the sauce and arrange the large capers in the bowl together with the salad leaves. 05 Aug	This entry was written by Joan Ransley and published on August 5, 2016 at 10:36 pm. It’s filed under Dinner and tagged cooking, fish, gluten free, healthy eating, IBS, IBS Network, Irritable bowel syndrome, lactose free, low FODMAP, low FODMAP diet, LowFodMap, sensitive gut, vegetables. Bookmark the permalink. Follow any comments here with the RSS feed for this post. Fantastic! Such an easy dish to make and so tasty!